The Rocket Wrestling Team did very well this year as they finished 2nd in the 4A State Championship Tournament. The Rockets finished 3rd last year and were aiming to take 1st this year but fell behind Clay Center. The Rockets had two Senior wrestlers take first in their weight class division. Aaron Hynick placed first in the 145 weight class division and Ryan Canale took first in the 112 weight class division. The other Seniors include Dustin Bowen who placed 2nd in the State in the 125 weight class division, and Ben Forsberg who placed 6th in the 160 weight class division at State. The Rockets finished with an overall record of 5-1 in team duals. The Rockets will surely miss the very talented senior wrestlers next year. Coach Eshelmen also recieved the 2007 Regional Coach of the Year. The Lady Rocket Basketball Team finished their season in their second sub-state game versus Andover Central. The Rockets previous game was a dominating win in the first round of sub state against Independence. The Lady Rockets finished the season with an overall record of 11-11. The Rockets will graduate six very important senior players this year, the seniors are not only athletically talented but are strong minded leaders for the team. They include: Nicole Dunphy, Jamie Knight, Bekah Sooter, Dava Logsdon, Madison Lucas, and Erica Herman. The Rockets will look to the underclassmen to fill in the senior positions next year. The Lady Rocket Basketball Seniors will surely be missed next year. The Rose Hill Rocket Mens Basketball Team had high hopes this year as they entered the post season with an overall record of 18-2. The Rockets barely beat Douglass in the first round of sub-state and then ending up losing by one point to Wellington. This was an unexpected end to a very optimistic season for the boys. With the graduating seniors, the Rockets will lose eight very key players for next year. The seniors include: Casey Coates, Josh Shirley, Brayden Crowe, Mike Smith, Ty Wisener, Taylor Stauffer, Josh Haydon, and Trent Ubben. With the loss of these key seniors, the Rockets will have to look for next years basketball players to step up and take control to fill the spots of the graduates. The Rockets season ended at the Sectional Championship game at the hands of eventual state champion Andale, who gave the Rockets their only two losses of the year. It was a dissappointing loss after playing probably the most exciting game of their season against Topeka Hayden, who defeated the Rockets in the State Championship game two years ago. This year was a little different as the Rockets beat Topeka Hayden 42-13. The graduating seniors include: Evan Webber, Caleb Flax, Aaron Hynick, Eric Page, Trent Ubben, Brayden Crowe, Josh Haydon, Josh Shirley, Mike Smith, Taylor Stauffer, Ben Forsberg, and Dustin Steinhelpert. The Rocket Football Team will be loosing a lot of talent as these seniors graduate. Hopefully the underclassmen will be ready to step-up and fill the slots. The Cross Country team had a great season this year with the biggest team they have ever had. Several people did a great job this year, finishing in the front of the pack several times was Colin Shelman and Elise Terrell. Colin had a great senior year, he added a lot to the program and will be missed next year. Elise Terrell headed to Wamego for state on October 28th. Elise did a great job and finished 12th at the State meet. 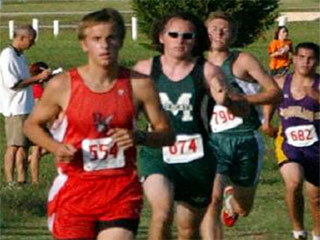 The team will have a lot of returning runners next year but will loose some valuable seniors this year. The graduating seniors include Colin Shelman, Jake Justice, Tyler Wilson, Rebekah Sooter, Erica Herman, and Jackie Cage. All the seniors have had a great year and will surely be missed next year.